It was customary to cook this delicious dish in the pan with the roast, letting thedriping fal upon it. 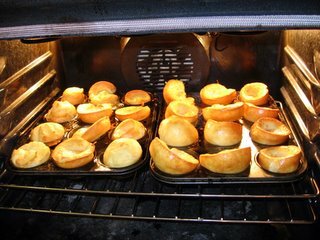 As many of us no long want extravagant drippings, we recommend cooking Yorkshire pudding separately in the hot ove requtred to put if up almost instantly. Continue to beat until large bubble rise to the surface. In 2 muffin pans, scrape about 1/2 a teaspoon of shortening into each cup. When oven is hot, place muffin pans in and watch until the shortening is melted and bubbling. Take pans out and immediately fill with batter (I usually use a large ice-cream scoop, this is just the right amount, I also use the same scoop for muffins). If you have a convection oven (hot air circulating oven) you can place both pans in. If not, don't risk it, just put in one pan at a time (in which case, only prepare one pan at a time with the hot oil, as it should be bubbling hot when you pour the batter in). Bake 20 minutes. Reduce heat to 350 and bake 10 to 15 minutes longer. They are ready when they are puffed up like in the picture, and golden brown. posted by Victoria | 1/22/2006 06:30:00 p.m. I have a confession to make. One of my ancestors on the Whitehead side of our family, so I have been told by my Mom, actually made the first Yorkshire pudding, back in the middle ages. It was a dark and stormy night in the Yorkshire dales. And the Archangel Gabriel was out on a mission when he got caught in the storm, drenching his wings and leaving his tunic and robe sopping wet. Off in the distance, however, he saw a farm house with a glowing from a small window, and smoke billowing gently from the chimney. This was the Whitehead home. "Archangel you're soaked! Come in by the fire and warm up your wings!" So Gabriel came inside the house, stooping so as not to hit his head against the ceiling which was far too low for his stature. He reclined by the fire and warmed his hands over the brightly burning embers. Looking for something to offer her heavenly guest, Mrs. Whitehead, realized she had no meat. Dashing to her cupboard, she realized she had no yeast for bread, either. All that remained was a few handfulls of flour, and a bit of oil. "Gabriel, would you excuse me a moment?" she asked demurely. Running to the chicken coop, she gathere a few eggs. In the stable, she milked the family cow. Returning the house, herself now wet, she found Gabriel standing in prayer. So as not to disturb him, she heated the pan with oil over the kitchen hearth, mixing together the eggs, milk, flour, and a pinch of salt. When the oil was hot, she added her mixture to the pan. It sizzled and bubbled, and the aroma that filled the house enchanted the archangel. "Glory to you, O God!" he cried, "For by Your mercy You have returned me to the courts of heaven!" "Ah, my dear Archangel, ye still be in Yorkshire," said Mrs. Whitehead. "But this pudding here will always remind you of heaven." 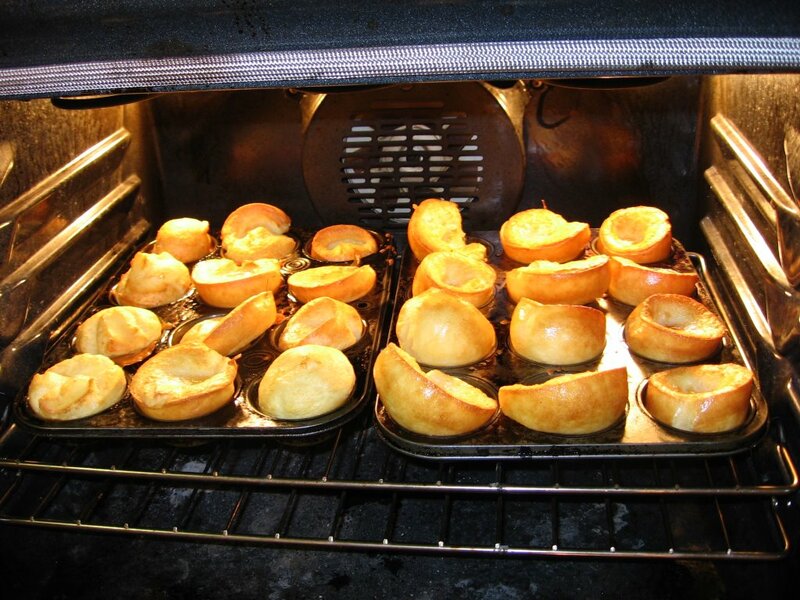 Please, someone, make yorkshire pudding for me. I promise to love anyone who does for ever! !